Blog Did You Pack Your Own Bags? “You’re too sensitive.” That phrase still causes a prickly sensation at the back of my neck that I can’t quite describe. I only know for sure that it stems from a deep anger that I’ve not yet been able to release in this lifetime. When I hear it said to anyone, like a reflex, my jaw tightens and I breathe in deeply through my nose, as my gaze immediately draws toward the earth for grounding. It’s the moment where I have learned to curtail the next words that come out of my mouth, because I know otherwise they will be laced with sarcasm and surrounded in a thick angry coating of my own emotional crap. So yes, this expression of “you’re too sensitive” gets me fired up. It was said to me a lot growing up, especially in my teen years, and it always made me feel inferior. It made me feel weak, which could not have been further from the truth. I began to choke my feelings back, stuff them down and drown them out, and this process made me into someone I was never meant to be. Someone I grew to dislike and dishonor, on a regular basis. Looking back on it now, I simply see it as part of my journey, as part of what has brought me to the beautiful place I am in today. Of course, I’m still human, like any of us, and some hurt runs so deep that it may take an entire lifetime to ever release it. As a matter of fact, I know that the emotional baggage that I swung around for years struck many a caring soul that got too near to me, and I will remain responsible for that, as we all must. 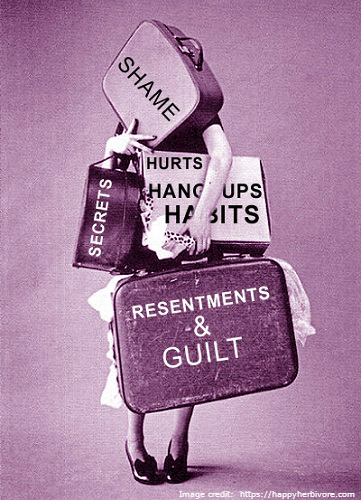 The truth is that we’re all swinging around some sort of emotional luggage, whether we realize it or not. The majority of the conflicts between people stem from someone’s feelings of inferiority, mistrust, resentment or anger, which then get tossed into situations where they don’t belong. The problem is that this journey of life is lengthy, and often we become so clueless as to how long we’ve been carrying certain feelings that we no longer recognize them as our own when they show up. We’ll inadvertently drop a big duffle-bag of our own broken emotional crap into the middle of an argument with someone that we love and then say “that’s not mine, it must be yours!” Then what do our loved ones do? Far too often they pick it up!! For real! Even though it was never theirs in the first place, and now your burden just added to theirs. Congratulations. They may even carry that weight far after you’ve parted ways in this life, now treating it as their own. Here’s the thing, as humans, we come equipped with this funky ability to hold back emotions that we feel may reflect poorly on us. We stuff them down into our soul, into our emotional body so that we don’t look weak or too sensitive. Even better, our soul stays hidden behind this mass of muscle and bone we walk around in. The perfect hiding place, right? We just tighten up our shoulders a bit, maybe endure some tension headaches, or field some great digestive issues. No problem! No one will ever be the wiser. The problem is that emotions are energy and energy is meant to flow. When we put a dam on a river, what happens? The river rises up, the pressure builds and the ability to progress and flow forward slows to a stop. The same thing happens to our emotional growth when we choose not to acknowledge and release the emotional burdens that block us. If we keep building the pressure up behind the dam, it’s going to start to crack. It may even just flat out explode, and what happens afterward is going to be messy. When that much negative emotion lets loose at once, it’s usually destructive, especially for those nearby. Let’s be real, you all know at least one dam explosion personally. It may even be you. When it happens, everyone else is just left staring at each other in shock asking “what the hell just happened?” And why are they in shock? Because far too many of us stuff our emotional BS down and hide it. We don’t cry in public, we don’t acknowledge our own needs, and we don’t ask for help with the imbalances that we feel, because, on some level, we think that it might bother people or make them uncomfortable. In the same way that we would expect someone to rush a crying baby out of a restaurant, we don’t want our cries for help to disturb anyone. Its pretty twisted isn’t it? Because when the dam breaks, the first thing the people closest to you will ask is “why didn’t you tell me?” And 9 times out of 10, what do we say to that question? “I don’t know.” The truth is, we just don’t know how. So who gets to decide what is “too sensitive?” Who gets to choose what makes someone weak or powerful? The ability to process emotion, to acknowledge our own feelings as valid, and to be able to truly feel and empathize with the needs of others is a sign of balance and strength. It is someone that doesn’t need to hide behind walls. Often, the most kind-hearted and sensitive souls are empathic, possessing the innate ability to both sense and feel the emotional pain of others. This means that at any given moment they are not only processing their own emotions, but also aware of, or even feeling, the emotions of others around them. Does this make them more sensitive? It sure does. Does it make them weak? Absolutely not. On the contrary, it makes them more likely to put their own needs aside to help others. It makes them quick to sympathize with another and want to help. It often leads them to be the first to extend their hand, even when they know it may come with great personal sacrifice, and say “let me help.” In my eyes, that’s not that weakness, that’s a warrior. About the author: Gail Lachs is a mom, a wife, a yogini, a Reiki master, an experienced medical professional and a natural clairvoyant medium. Together with her husband, Steve, she owns Windsoul Studio Yoga and Healing Center in Tyngsboro, MA. As the director at Windsoul Studio, she teaches the importance of the mind, body, spirit connection, and is a strong advocate of the physical and spiritual benefits that yoga, meditation, energy healing and a healthy lifestyle lend to our physical health and emotional well-being.